Riding the surging wave of first-rate, gallery curated exhibitions, DiDonna in New York excels with “Fields of Dream: The Surrealist Landscape” (through December 18), a rich, salon-style installation of more than 70 paintings and sculpture ranging in time from the 17th century, represented by the German master Matthaus Merian the Elder’s “An Anthropomorphic Landscape in the Shape of a Man’s Head,” to Giorgio de Chirico’s interior with skyward view, “I due soli,” from 1969. Di Donna’s line-up delivers an outstanding compilation of Surrealist-era works, offering a satisfying alterative for those less inclined to head to MoMA to hunt down its superb collection of one of the 20th century’s greatest art movements. The exhibition is accompanied by a hardcover catalogue, complete with a textured cover illustrating Rene Magritte’s compelling composition “Le Faux miroir,” circa 1950, depicting a single eye reflecting a picture perfect blue sky within its iris. Inside, a lengthy essay by the art historian Ara H. Merjian, “Where is Surrealism? Painted Spaces from Dreamscapes to Inscapes,” offers thorough information on the Surrealist canon. The catalogue also includes an extensive checklist detailing a fascinating array of exhibition history of the individual art works. The exhibition is playful as well, with the aforementioned Anthropomorphic Landscape executed in the style of Arcimboldo, echoing past the Salvador Dali composition in gouache on paper, “Mysterious Mouth Appearing in the Back of my Nurse,” 1941, comprised of a fantastical landscape forming an anthropomorphic female head. Giorgio de Chirico, though never an official participant of the Surrealist movement, which launched in 1924 with Andre Breton’s Surrealist Manifesto, is certainly the godfather figure here, starting with his moody and magnificent “La Mediation Matinale,” 1911-12, an early example of his extraordinary Metaphysical painting series, featuring classical figures and statuary stationed in a shadowed piazza overlooking a hypnotically calm sea. 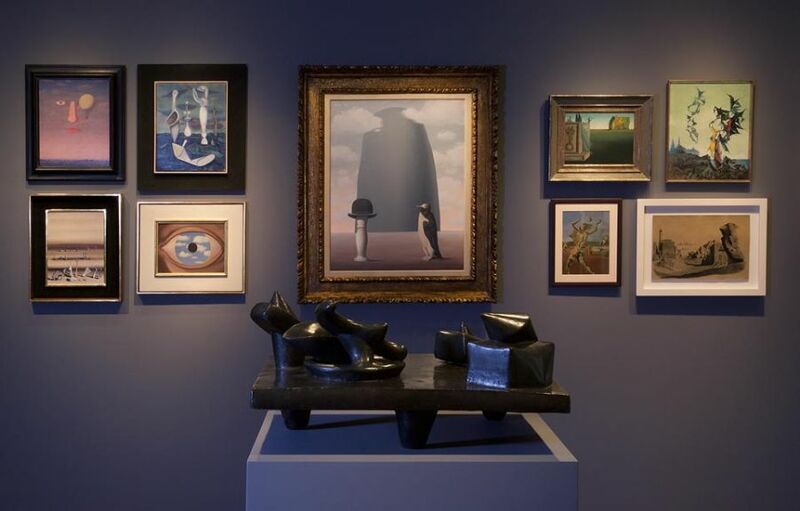 (If you want an added blast of things de Chirico, head to 975 Madison Avenue and take in “Mnemosyne: de Chircio and Antiquity” at the Helly Nahmad Gallery, in association with Phoenix Ancient Art. Mnemosyne, a Greek goddess, is the mother of the Muses). While Surrealism’s market stars — including Rene Magritte, Salvador Dali, and Max Ernst — are represented with several examples each, works by lesser known artists from the period are also featured here, such as Oscar Dominguez’s tiny but terrific “Paysage cosmique,” 1938, in oil on wood in a bespoke wooden box frame created by Georges Hugnet, and Frederico Castellon’s eerie and rather terrifying 12 by 9 inch “Forgotten Man,” circa 1935 (the artist certainly gives Dali a run for his money, at least in this work). Still, some of the more memorable works in the exhibition are by Dali and Magritte, including the former’s “Girafe en feu,” 1937, a gouache, charcoal and ink on paper depicting, it would seem, a cataclysmic landscape, and Magritte’s “La Condition humaine,” 1949, also a gouache on paper but mildly hallucinogenic with a cave-like interior illuminated in part by a fire pit and centered by an easel bearing a blue hued mountain landscape of the view through the blasted out rock. With the illustrated checklist in hand, it promotes a pleasurable viewing feeling, drifting through the two gallery rooms and stopping willy-nilly at something unfamiliar or riveting that catches the eye. The exhibition also includes works by Surrealist women artists, such as Leonora Carrington, Leonor Fini, Jacqueline Lamba, Kay Sage, and Dorothea Tanning, with Sage’s enigmatic “Contraband,” 1961, a mixed media construction comprised of wood and stones, suggesting another kind of landscape looking beyond the confined borders of Surrealism. In this way, the exhibition looks both back to the past and ahead to the future. This entry was posted in Reviews and tagged Dorothea Tanning, Giorgio de Chirico, Jacqueline Lamba, Kay Sage, Leonor Fini, Leonora Carrington, Matthaus Merian the Elder, Max Ernst, Oscar Dominguez, Rene Magritte, Salvador Dali. Bookmark the permalink.